The tourists who want to fly like a eagle should try paragliding from the cliffs at Rishikesh. As you start gliding in the open skies of Rishikesh you can feel your blood rushing through out the body. 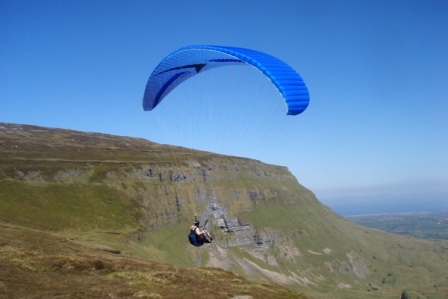 Paragliding is not for the fainthearted as you have to glide in the sky with the support of only the glider. As their skills progress, students move on to steeper/higher hills (or higher winch tows), making longer flights, and learning to turn the glider, control the glider's speed, then moving on to 360А turns, spot landings, big ears (used to increase the rate of descent for the paraglider), and other more advanced techniques. Training instructions are often provided to the student via radio, particularly during the first flights. During your adventure tourism in Rishikesh, you can try the sports that are thrilling and exciting. Rishikesh offers a variety of sports which cater to different people having different tastes. Hence on your trip to Rishikesh do not forget to assign at least one day for trying these amazing sports in close proximity to nature.